In the world of interior design, thousands of bits of crucial information are scattered across an array of sources. This work collects the information essential to planning and executing interiors projects of various shapes and sizes. It also includes a section on resources that gathers a useful data, from guidelines to online sources. In the world of interior design, thousands of bits of crucial information are scattered across a wide array of sources. 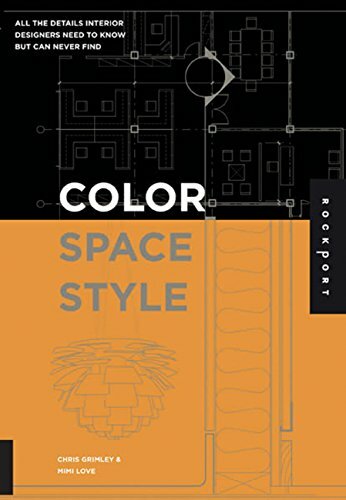 "Color, Space, and Style" collects the information essential to planning and executing interiors projects of all shapes and sizes, and distils it in a format that is as easy to use as it is to carry. Section 1, "Fundamentals", provides a step-by-step overview of an interiors project, describing the scope of professional services, the project schedule, and the design and presentation tools used by designers. Section 2, "Space" examines ways of composing rooms as spatial environments while speaking to functional and life-safety concerns. Section 3, "Surface", identifies options in color, material, texture, and pattern, while addressing maintenance and performance issues. Section 4, "Environments", looks at aspects of interior design that help create a specific mood or character, such as natural and artificial lighting, sound and smell. Section 5, "Elements", describes the selection and specification of furniture and fixtures, as well as other components essential to an interior environment, such as artwork and accessories. Lastly, section 6, "Resources", gathers a wealth of useful data, from sustainability guidelines to online sources for interiors-related research.